Before the start of each new season, Gotham offers Pre-Tryout Open Plays for players registered to try out for specific Gotham Divisions. These open plays provide opportunities for Captains-elect and aspiring players to meet and greet, to scout and be scouted. To promote and protect the special purpose behind this less-common Open Play format, the players who will be trying out for any of the upcoming season’s Divisions for which the Open Play is designed to be a showcase of skills, will receive priority in our registration process over the Captains themselves. Players are encouraged to wear their tryout numbers during the Open Play, and Captains are encouraged to come scout and take notes. Captains are asked *not* to register and play in the open play, unless they are also registered and committed to try out for a higher division. Captains who wish to play while scouting, are welcome to come register in person at the start of the open play, but only if spots remain available for purchase. Registration will open the Friday before each Open Play. You must register for Spring 2019 Tryouts prior to registering for Pre-Tryout Open Plays. The two venues for Pre-tryout Open Plays are the O.Henry School on West 17th Street between 8th and 9th Avenues and the Bayard Rustin Educational Complex, 351 West 18th Street (between 8th & 9th Avenues), in the 7th Floor gyms. The registration fee is $15, payable below via PayPal. If you PayPal indicates the Open Play is Sold Out, then just click Continue Shopping to join our wait list! NOTE: If you are drafted to a team, (congratulations) you will then be ineligible to participate in any remaining Pre-Tryout Open Plays. If you have already registered, you will be refunded. 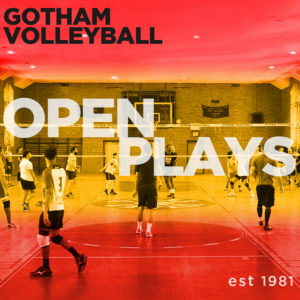 IMPORTANT: Please go to the OPEN PLAY drop-down menu in the red banner above and select “About Open Play” for more information on open play schedules, formats, eligibility, and registration rules & procedures.